I know from personal experience as a fitness trainer that it can take a lot of courage when it comes to stepping through the doors of a fitness establishment or gym for the first time. This is a whole new world for many people and the gym environment can easily make a newbie to fitness feel like a fish out of water! Although investing in a gym membership and visiting a gym several times per week to train has massive health benefits and is a great place to start on your fitness journey, it is clear to me that many people who want to lose weight, get fit or simply become more active will put off or even develop a no-go-attitude when it comes to joining a gym. This is why I have invested the time in developing this fitness plan, Home Workout for Beginners. Know you need to do something about your situation as the weight is creeping on, your fitness levels are dropping and you know that only a lifestyle change will help you. Again, my Home Workout for Beginners fitness program is exactly what you need! A full 6-week progressive exercise routine for any fitness level. A beginner fitness plan that focuses on cardio exercise for fat burning, and resistance exercise for muscle tone. A routine that makes use of minimum exercise equipment. 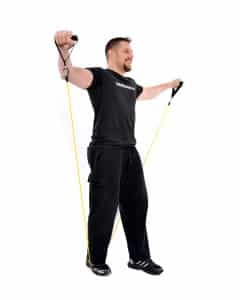 A beginner fitness plan that gives you a full body workout that you can do in a short time using only exercise bands and body weight. Is Motivation a Problem for You? Check out my latest book, Fitness & Exercise Motivation. Inside this book, I give some pretty solid advice and tools that can help you stay motivated long enough for you to get your first set of fitness results; and after those first results, it’s a downhill journey! Trust me, I’ve been there many times myself in the past. So, if you are ready to finally get some fitness and weight loss results, let’s get started! I am always here to help you on your journey, so, please, don’t hesitate to drop me an email if you need more advice or run into any problem. I will always help you out wherever I can.